The word ‘tweet’ has now been officially added to the Oxford Dictionary and this is also the first time that a new word was added before it was used for at least ten years, as it was the tradition going on in the process of adding new words in the dictionary. 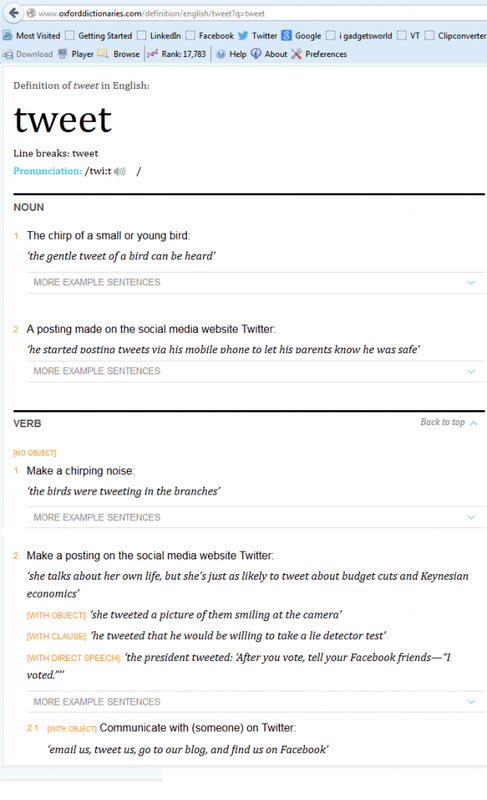 “The noun and verb tweet (in the social-networking sense) has just been added to the OED,this breaks at least one OED rule, namely that a new word needs to be current for ten years before consideration for inclusion. But it seems to be catching on”, John Simpson, Chief Editor, Oxford English Dictionary, said. The word ‘Tweet’ was earlier added in the dictionary in relation to the bird song, but never used as a term used in social media or related to internet. Now there is an additional official definition of the word tweet. According to the Oxford English Dictionary the word “tweet” is defined as “a posting made on the social networking service Twitter” and as a verb, it is defined as “to post on Twitter.” Some other such words were also added this year to the oxford Dictionary, including big data, crowdsourcing, e-reader, mouseover, redirect (the noun), and stream (the verb). Twitter has been a popular microblogging site and mostly very populart because of the celebrities, stars and world leaders used twitter first as a mean to9 step into the social media and communicating with fans.